Peal the skin karela and make a vertical cut peel the seeds, apply the salt and turmeric powder in it and keep it aside for ½ an hour. Dry roast peanuts, Coriander seeds, garlic, Onion and dry red chili make it cool for 5 minutes. Add salt and grind them roughly. Rinse the juices from karela. Stuffed the grind masala into the karela’s. 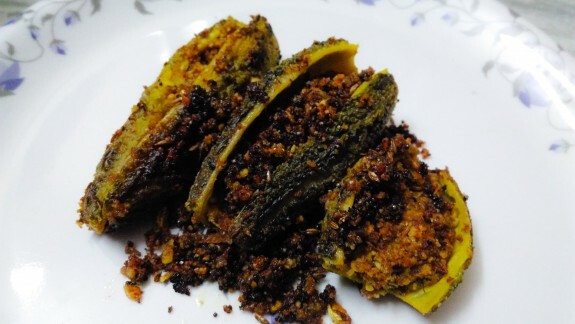 Heat oil in a pan and add cumin seeds, mustard seeds and crackle them now drain the stuffed karela in it and cover the pan and cook it till it turns brown and karela is cooked. Stir it randomly. The yummy and spicy Stuffed or bharwa karela is ready to serve. Serve it with Chapati or chawal. Tip: Tie the tread on karela so that masala is not coming out from karela while cooking. Remove it before serving.